Note: As of August 1, 2018 we are not accepting any new orders for wood storm windows. Sorry for the inconvenience. 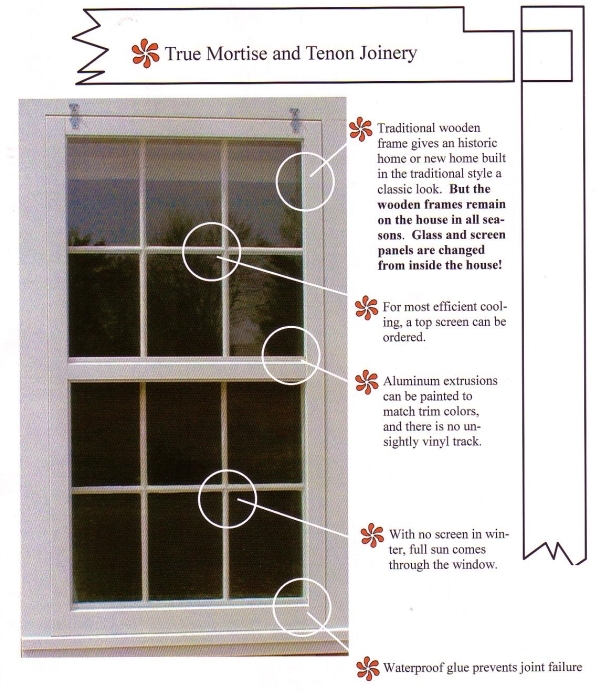 Looking for traditional wood storm windows or are you tired of those unsightly aluminum triple track storm windows. Our Transition™ line of wood storm windows offers traditional style with modern convenience. These are also the perfect replacement for Rivco and Brosco storm windows. You do not have to take down seasonally like the wood storms of yesterday. The glass or screen inserts remove in seconds from inside the comfort of your home. Replacing a single pane window does not necessarily result in greater energy savings than upgrading the existing window. Exterior storm windows can reduce air leakage by 45%-75%. Weather-stripping single pane windows also will significantly reduce air leakage. **A tight weather stripped single pane window with low-e storm is about R-3. Energy star rating is 3.3 for typical low-e double pane windows with Argon gas. View the video below to see how easy and convenient it is to change from Winter to Spring and back again from inside your home. OWR storm windows are constructed of solid clear eastern white pine treated with a commerical Borate preservative and primed with a premium grade primer. Construction is mortise and tenon glued and pinned for durability. Weep holes are built into the bottom rail. Each storm window is mounted with two stainless steel hangers and matching hook and eye. We recommend flush mount using our optional 1/2 x 3/4" angle frame applied to the edge of the exterior case trim. Typical residential storm windows by OWR will run from $300 to $400 depending on size and features such as upper screen (~$20), angle mounting brackets,(~$25), low-e glass(~$50) and finish painting ($40). Each window is built to your specification and handcrafted. See the spec sheet and how to measure directions below. Click here for short video showing features and options. For more information on upgrading (not replacing) your single pane windows. Check this fact sheet on low-e storm windows and how quickly they pay for themselves.